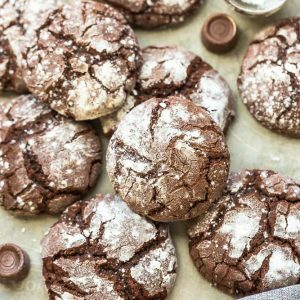 Caramel Filled Chocolate Crinkle Cookies are soft, chewy and the perfect cookie to add to your holiday cookie platter. Now that Thanksgiving is over, we’re shifting our focus on all things Christmas. One of my absolute favorite things to do during the holidays is bake my way through all the yummy cookies. While I love experimenting with new and different flavors each year, the classics always hold the most special place in my heart. 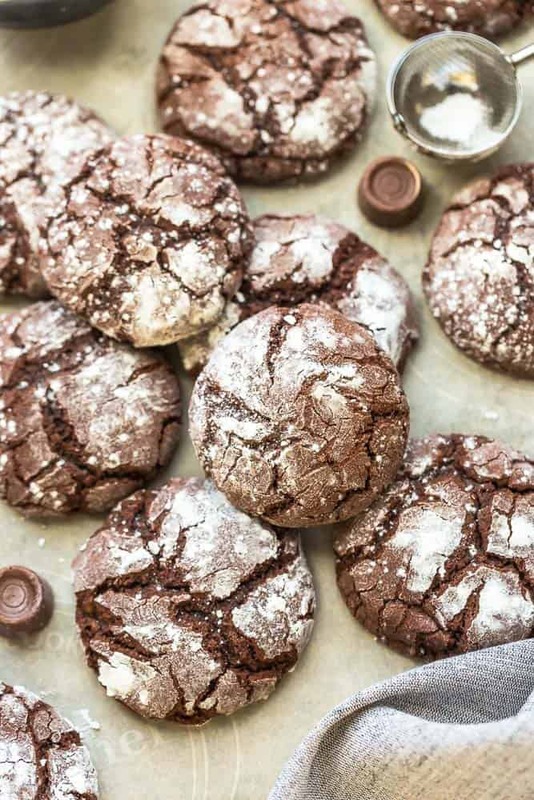 Chocolate crinkle cookies are a holiday staple with their snowy powdered sugar surfaces. 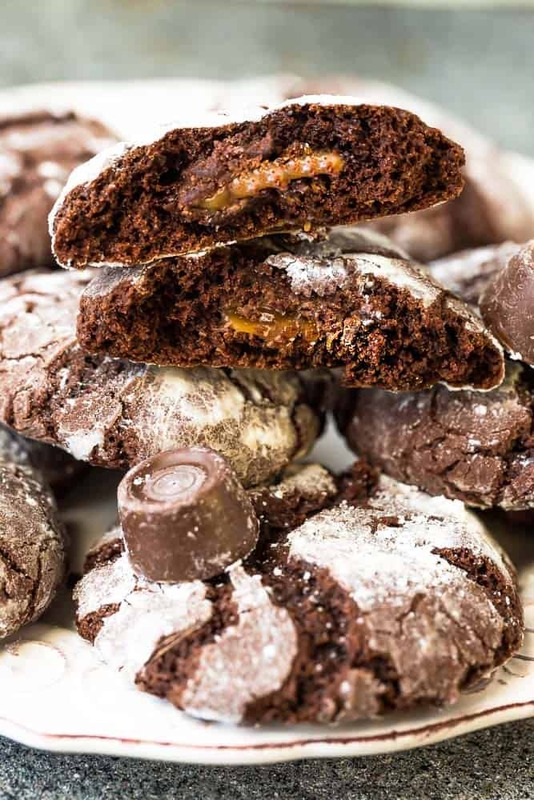 They’re indulgent little treats that are actually really simple to make and Naomi Robinson of Baker’s Royale made them even more irresistible by stuffing them with a Rolo inside. I have been a long-time fan of Naomi’s blog and couldn’t wait to start baking from her new book. She’s not only super talented but super sweet and witty. Her photography style is so beautiful and her food styling skills are amazing. 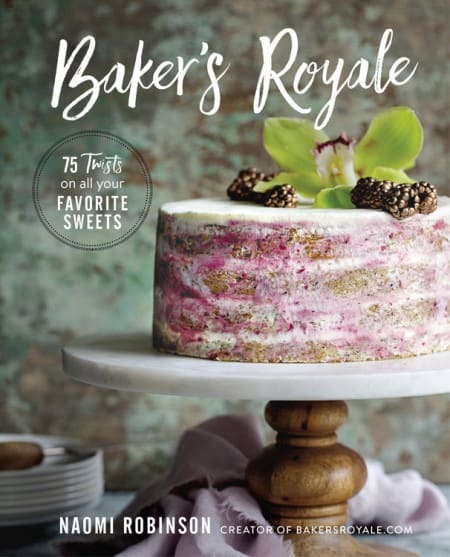 If you’re looking for a book to gift or bake from during the holiday season, this book is a good one! The recipes in the book are destined to become classics. They range from easy cookies to layered cakes. There’s something here for every occasion and every home-baker baker, no matter your skill level. 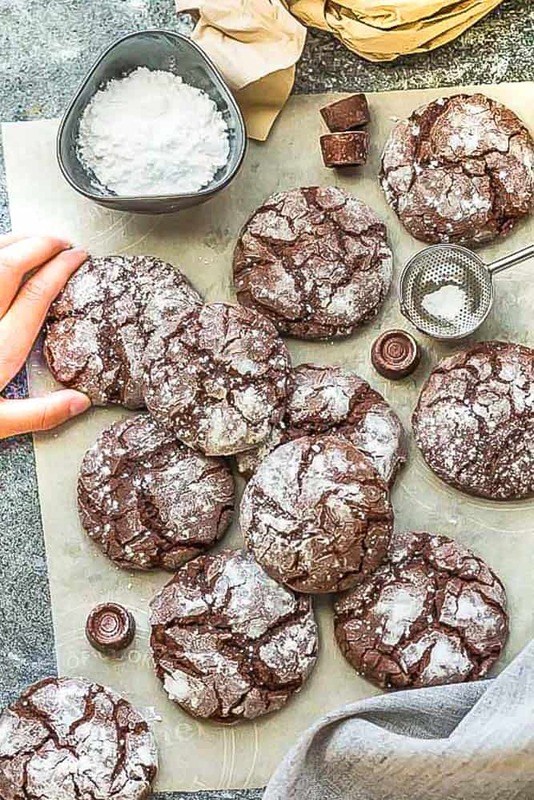 It was so tough choosing what to make first and we’ve already tried the yummy granola, no bake cookies and today I’m sharing these insanely delicious Caramel Chocolate Crinkle Cookies. These cookies are super easy and fun to make, especially with your kids. Just mix together the standard dry ingredients and combine with melted butter, sugar and eggs. 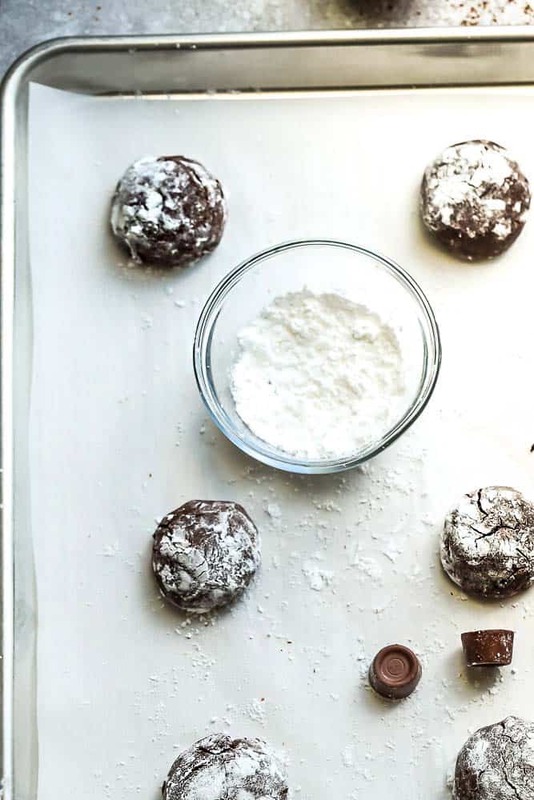 Once your dough comes together, flatten each cookie dough ball and place a Rolo inside. Then form into a round ball again and roll that in powdered sugar. 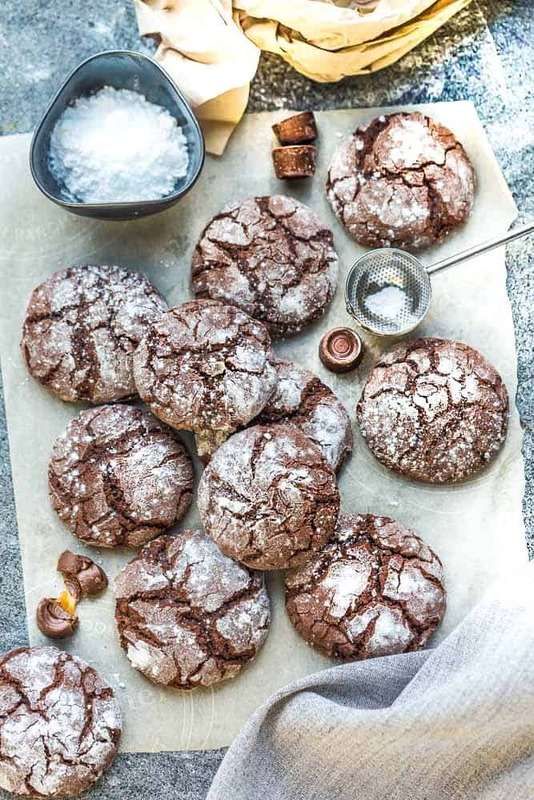 Then, as the cookies bake, the confectioners’ sugar coating crinkles and cracks as the cookies take their shape. Try these right out of the oven. OH MY GOSH. Like, pure fudge. They’re soft, chewy and will melt in your mouth! So much heavenly chocolate. Chocolate and caramel wrapped into one cookie! This recipe is perfect for cookie swaps and Holidays! Preheat the oven to 350 F. Line 2 baking sheets with parchment paper and set aside. In a medium bowl. whisk together the flour, baking powder, espresso powder, and salt. Set aside. Melt the butter in medium saucepan over medium heat or in microwave-safe bowl in 20-second increments. Whisk in the cocoa powder and brown sugar. Whisk in the eggs thoroughly, one at a time. Add the wet ingredients into the dry ingredients and mix until just combined. Scoop out 2 tablespoons of cookie dough rounds and use your hands to roll into a ball, then flatten to 1/4 inch (6mm) thick. Add a Rolo candy to the center and wrap the dough up around the candy. Roll this into an even ball, then roll it into the confectioner sugar until heavily coated. Repeat with remaining dough and candy. Place the cookies 2 inches apart on the prepared baking sheets. Bake in preheated oven for 8 to 10 minutes, until the cookies look crinkly and spread slightly. Allow the cookies to sit on the baking sheet for 5 minutes before transferring to a wire rack to cool briefly. Make sure to serve warm to get the gooey caramel. Oh man – these look incredible, Kelly! Rolos are one of my favorite candies so I know that I’d absolutely snarf these up!